As far as people show interest in this topic I decided to perform an additional measurement to the one I performed in Part 1. This time I wanted to compare floating point numbers operations performance because my good friend Anonymous worried about it. He said that I shouldn't have abused lua interpreter with basic arithmetic operations on integers because it's not good at it. He said that I should have tried floating points numbers instead to let lua interpreter shine. I was a bit skeptic about it to be honest but Anonymous's logic was sound. To calculate the exponent function I take first 100 terms of the Taylor series and all interpreters should operate with double precision at least because floats would be overflown by factorials. Indeed lua is really good at floating points numbers operations! 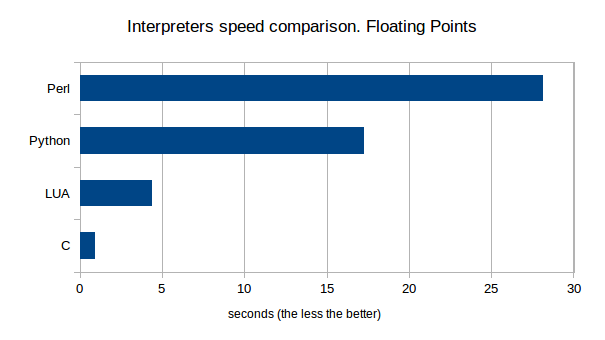 It is only 4.5 times slower than the C version! Anonymous was right after all and Perl is busted!